Is Your Child Protected from Dengue? Hubby came home last week bearing bad news. He said the middle son of an officemate, a four-year-old boy, died of dengue. I really sympathize with this kid’s mom and dad. Losing a child is the worst thing that could happen to a parent. Hearing this sad news made me even more paranoid than I already was. I’m a first-time mom who knows nothing about raising kids, and because of that, I always make it a point to text or call my son’s pediatrician for whatever discomfort my son feels. I’m just really thankful that my son’s pedia is very accommodating. On our recent visit to her clinic, I asked for some tips on how I can protect my son from dengue, especially when he’s in school. She recommended a natural mosquito repellent bracelet. She said it’s available in the hospital’s pharmacy, but it’s quite expensive. I tried looking for one when I did my grocery shopping last Saturday, and I found something cheaper: Simba Natural Mosquito Repellent Bracelet. The Simba Natural Mosquito Repellent Bracelet has natural citronella and lemon extract. It is guaranteed safe and non-toxic, and it has no DEET (N,N-Diethyl-meta-toluamide). It comes with a reusable zip lock bag for easy storage. The bracelet is adjustable and can be worn around the wrist or ankle, it provides continuous 168 hours protection, and it creates a 1-meter protection area. If the bracelet is not continuously worn for 168 hours, you can store in the zip lock bag to maintain service life. There’s a Simba Natural Mosquito Repellent Bracelet for kids and adults. I also remember I bought a similar product a few months ago that I’ve forgotten to use, and it’s just lying idle in my storage cabinet. Now that dengue season is here, I pulled it out of its hiding place, so I can put it to good use. I found Simba Natural Mosquito Repellent Sticker. 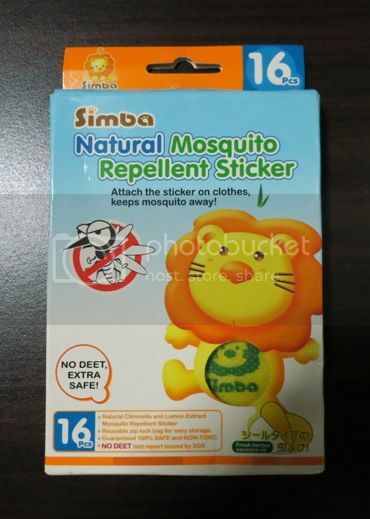 The Simba Natural Mosquito Repellent Sticker can be used by kids and adults alike. It has the same features as the Simba Natural Mosquito Repellent Bracelet, except that this time, you have to attach it to your clothes, cap, shoes or a location near you to form a 1-meter protection area. It provides up to 72 hours service protection. The Simba Natural Mosquito Repellent Sticker won’t look good on my son’s school uniform, so I’m saving it for other outdoor events. We put the the Simba Natural Mosquito Repellent Bracelet around his ankle instead. He has started wearing the bracelet since yesterday. I hope it gives him all the protection he needs when he’s in school. We also took extra precautions at home by making sure there’s no stagnant water lying around the house and of course, keeping the house clean every day. What preventive measures have you undertaken to protect your child from dengue? This entry was posted in Dengue, Simba Natural Mosquito Repellent Bracelet, Simba Natural Mosquito Repellent Sticker. Bookmark the permalink. 3 Responses to Is Your Child Protected from Dengue? Do not attach the stickers to clothes. The adhesive is such a pain to remove from fabric. What I do is I just cut one sticker (still with its paper backing), then insert it on a pocket (of clothes or bag) or use safety pin to attach to clothes (safety pin obviously only for adults). Thanks for the advice! I’ll keep that in mind! i think we need this as well!